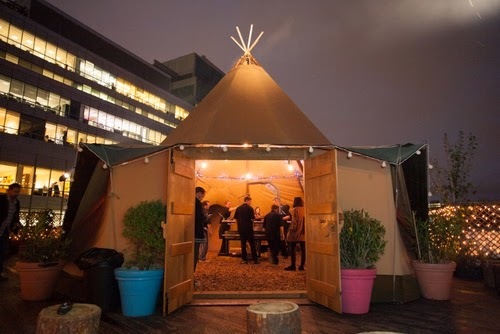 Wigwambam, the very popular heated rooftop bar at The Queen of Hoxton, is back for winter 2013/14 with a Nordic theme, including a Tipi, candlelit lanterns, wild boar sausages, hot punch, and hot spiced cider. It's open Monday - Saturday, and on Sundays some weeks. "You know Autumn has truly arrived when you’re riding the bus down Shoreditch High Street and you spot an 8 metre high tipi on the rooftop of the Queen of Hoxton! WigWamBam is back but this time with a twist. Inspired by the Nordic regions and the green flickering curtain of the Northern Lights, this year’s WigWamBam will feature East London’s very own answer to Mother Nature’s theatre of light - The Eastern Lights. These pretty visuals will be projected onto the exterior and interior of the wigwam structure. Inside the wigwam you’ll experience an atmosphere of Scandinavian settlement meets Norwegian tribe; a cosy den of deer hide covered seating, candlelit lanterns, colourful indigenous wall hangings and of course, the roaring flames of the central open grill cooking a daily rotating menu of delicious polar region inspired cuisine. Think Wild Boar Sausages with Forest Fruit Chutney, Leg of Pork with Chestnut and Herb Stuffing and Hot Smoked Salmon and Dill Burger. And it wouldn’t be a Queen of Hoxton experience without a well stocked bar of winter warmers such as Hot Gin Punch and Hot Pumpkin Spiced Cider. Don’t forget to tear yourself away from the wigwam snug, grab a stick of marshmallows and get toasting over the fire pits, yum! If you have a keen eye, be prepared to unearth a discovery of your own elsewhere on the rooftop. Explorer, Arthur Lane has made his mark on the Queen of Hoxton and it’s up to you to tweet your findings for fellow pioneers to uncover too... The magnetic force of our East pole will draw you in and transport you to the cosiest rooftop in town. Think you know the WigWamBam? It’s not quite as you remember it, so get yourself up here this October!"